Monday was a Mack Truck Day. We had performed twice on Sunday and I was getting over a cold; I felt like I'd been hit by a big ol' truck. On any other Mack Truck Day I would have just had cereal for dinner...but I'd eaten the last of it that morning. It was time for Weeknight Crepes. Step 1: Go to your bookshelf. 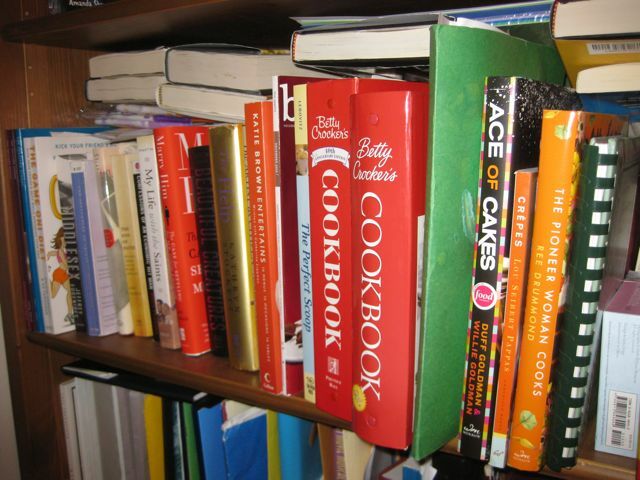 Decide whether to use the 40th anniversary or 50th anniversary edition of your trusty Betty Crocker red binder cookbook. Ignore the crepes cookbook three books to the right. Step 2: Place cookbook on table ironing board. 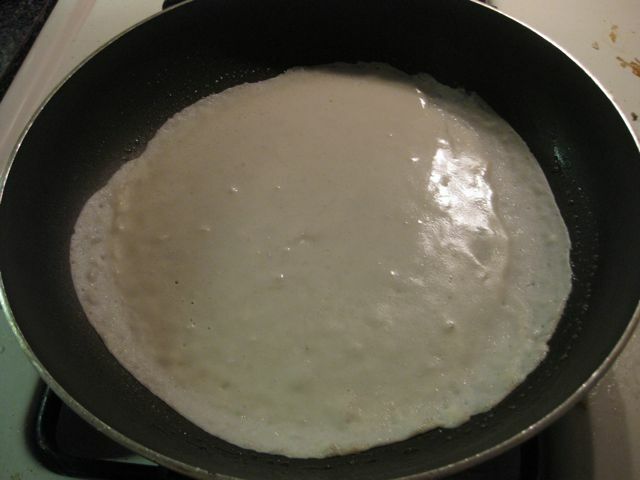 Flip through index to find crepe recipe. Under Desserts? No. Under Breads? Must be. But where? Think how much easier this would be if you could search a cookbook like you can baking blogs. 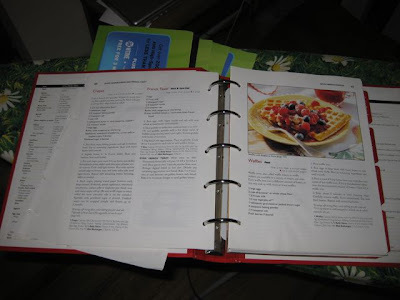 Finally find crepe recipe under Pancakes, French Toast, and Waffles and flip to page 60. Get distracted by the yummy waffle picture on page 61. 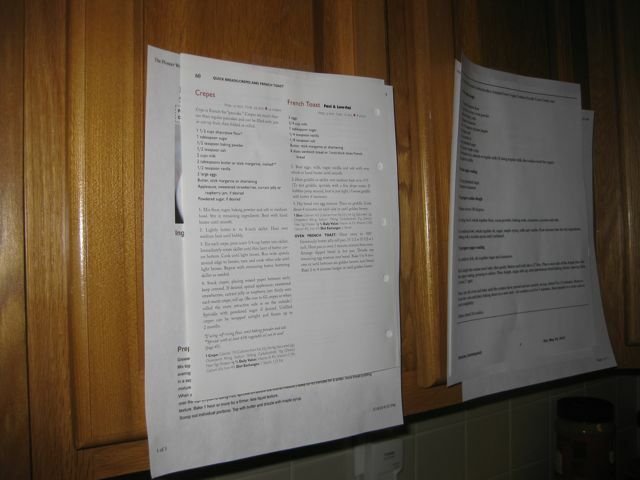 Step 3: Tape recipe to your cupboard. 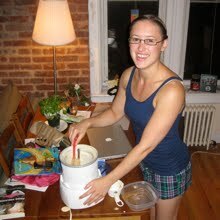 Consider taking down recipes from last five or so things you baked. Then decide that can wait. 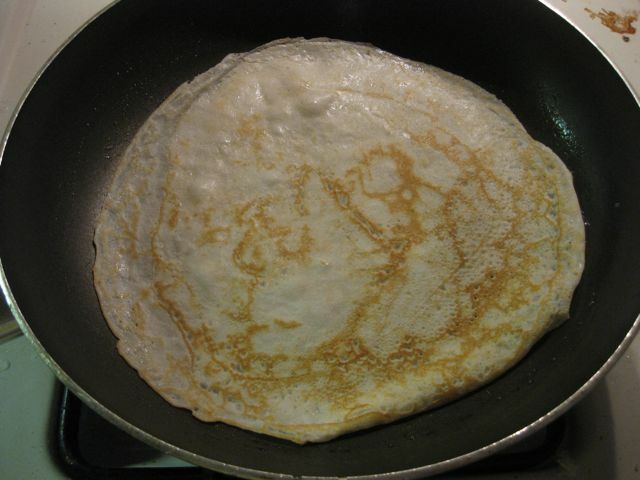 You have crepes to make, afterall. 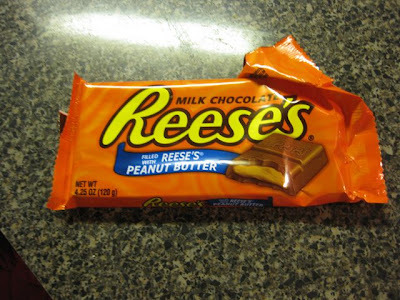 Step 4: Notice this candy bar you bought the other day simply because you had never seen a Reese's candy bar before. Decide it's time to try it. The crepes can wait a few more minutes, right? 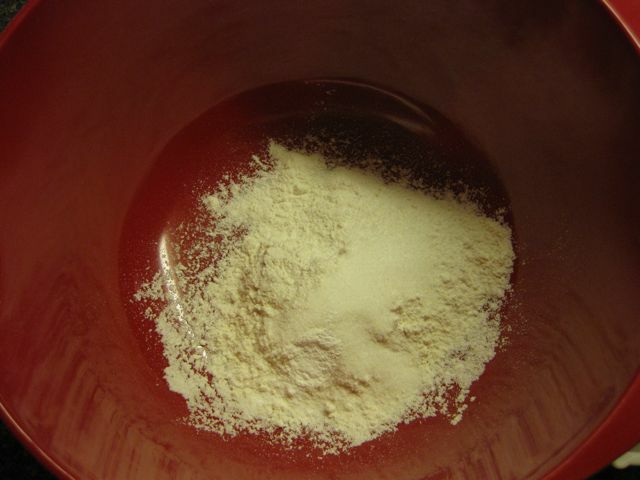 Step 5: Measure out your dry ingredients - flour, baking soda, sugar, salt. 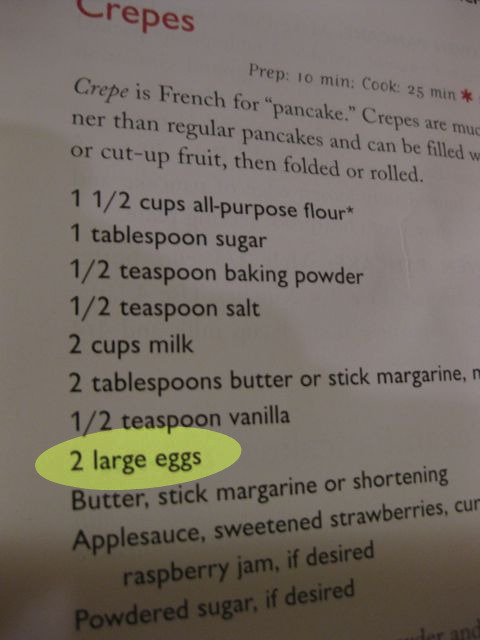 If you're making crepes for one, quarter the recipe, as I did here. Step 7: ...Notice that because you're quartering the recipe, you now have to divide an egg in half. Most annoying thing ever. Step 8: Get over it. Crack one egg into a measuring cup and whip until pourable. Step 9: Go to wash your eggy hands. 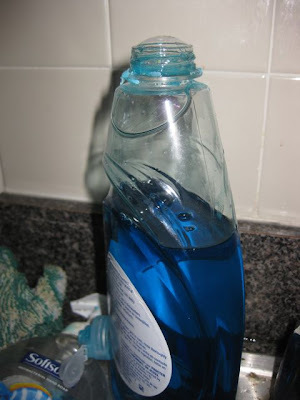 Narrowly avoid dumping an entire bottle of dish soap everywhere because somebody didn't screw the cap on all the way. Remember that it was probably you. 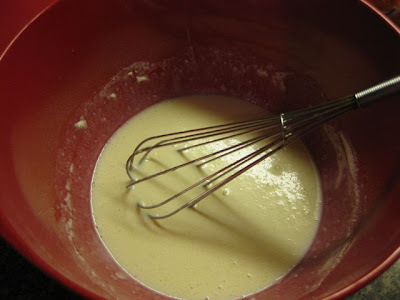 Step 10: Pour 1/2 your egg into the batter and stir to combine. Step 11: Have another piece of that Reese's bar. Go ahead. No one's gonna know you ate your dessert before your "dinner." Step 12: Heat a skillet over medium heat. Grab that leftover 1/2 or 1/3 or 1/4 stick of butter that's been sittin' in your fridge waiting for its destiny. 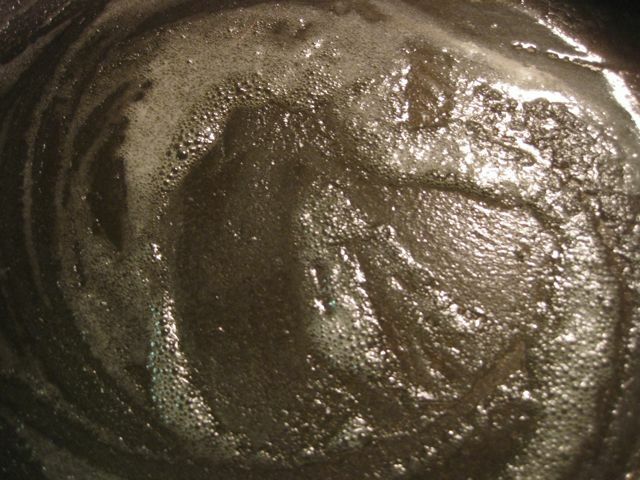 Rub it all over the medium-hot skillet. Step 15: Choose your fillings. 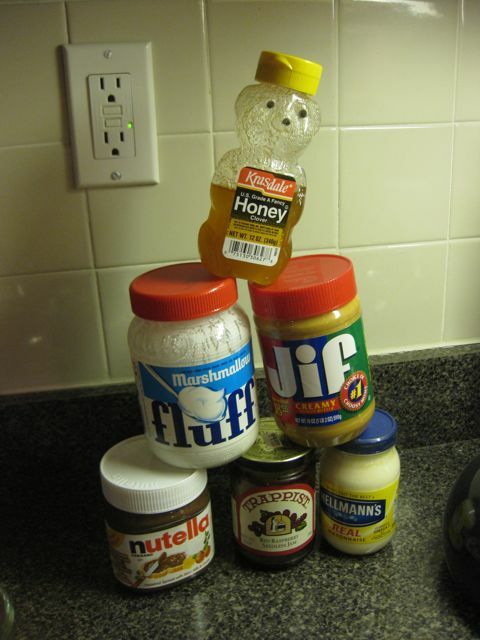 Building a pyramid is entirely optional but highly recommended. Mayonnaise is not actually recommended as a filling, but highly recommended when in need of a sixth member of your spreadable fillings pyramid. 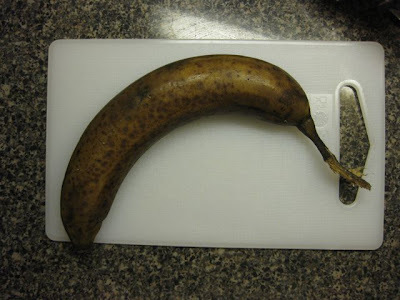 Step 16: Grab a banana from the fridge. Admit it looks disgusting. But have faith that since you put it in the fridge at its perfect ripeness, it is still perfect inside. 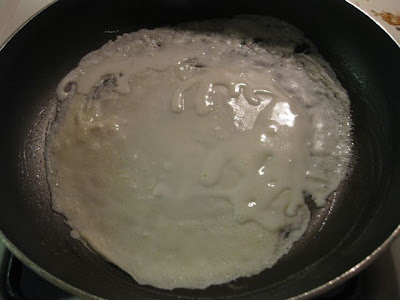 Step 17: Grab a crepe. Notice that it's no longer hot because you spent too much time building spreadable filling pyramids. Decide it doesn't matter. Spread on your spreadable filling and top with fruit. 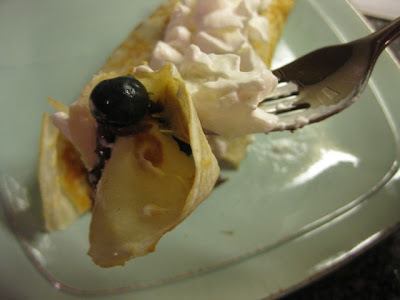 Step 18: Roll crepe up and top with whipped cream - and don't use any of that homemade stuff either. It's a weeknight - the canned stuff just does fine. Step 19: Eat your Weeknight Crepe, right there at the counter. 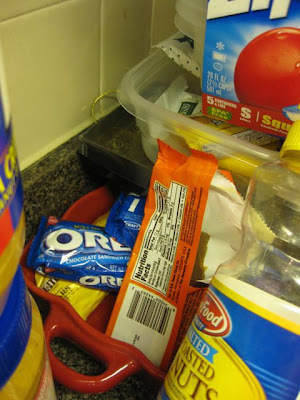 Step 20: Banish that Resse's bar back to the corner. 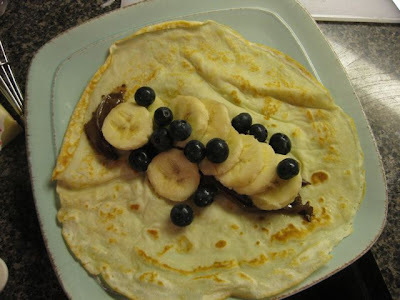 It's got nothin' on the Weeknight Crepes. 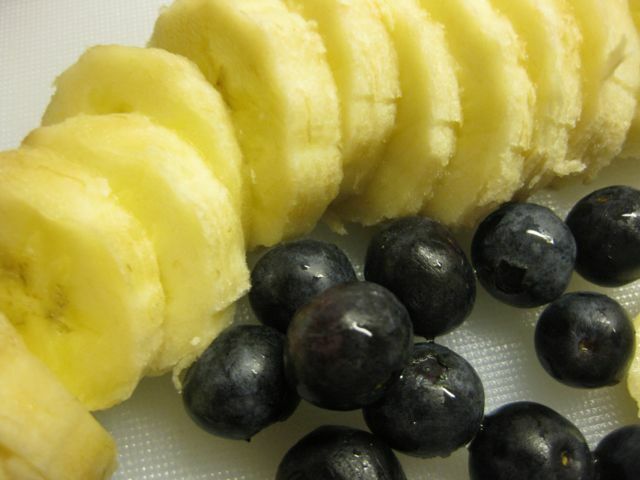 Sliced fruit, berries, chocolate chips, etc. 1. Mix flour, sugar, baking powder and salt in medium bowl. 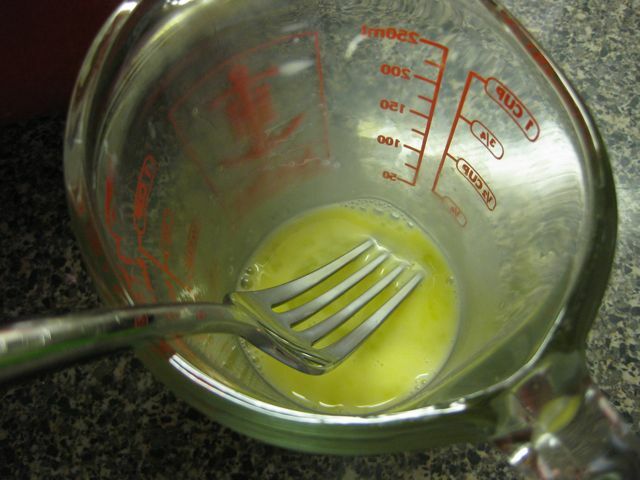 Stir in remaining ingredients. Whisk until smooth. 2. Lightly butter 6- to 8-inch skillet. Heat over medium heat until bubbly. 3. For each crepe, pour scant 1/4 cup batter into skillet. Immediately rotate skillet until thin layer of batter covers bottom. Cook until light brown. 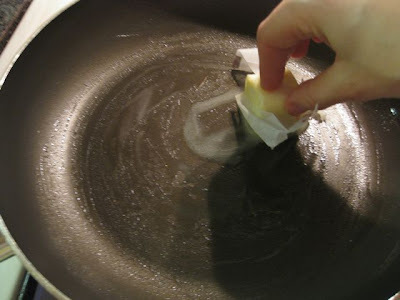 Run wide spatula around edge to loosen; turn and cook other side until light brown. Repeat with remaining batter, buttering skillet as needed. 4. 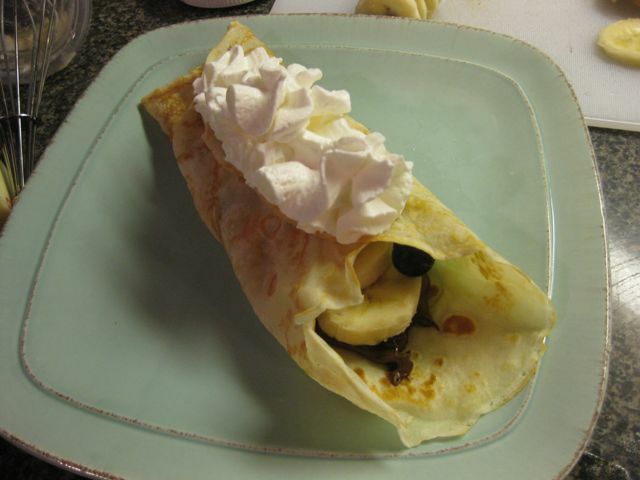 Spread your spreadable filling on a crepe and add fruit; roll up. Top with whipped cream. Oh, Katie, what a trooper. My track record shows I only do crepe marathons involving stacks and stacks, but this looks like a doable modification. And I will note this is the second time in a week I have seen Trappist jam- what's up with that? What a great blog! I'll add you to my Google Reader. ...and notice the two gigantic jars of peanut butter on the counter that Mama B sent so you can make peanut butter cookies (and actually because she really wanted to get the best "bang for her buck" when she sent you a "flat rate" package). - Sorry, Beck that you had to carry that heavy package, but you'll forgive me when the cookies come out of the oven! My favorite post thus far! I was cracking up so much that Husband asked what I was reading. Naturally I took the peevish route and didn't tell him. Let him wonder. Now, here's where I admit that up until now I've always bought my crepes. Yes, as in I purchased a package pre-made crepes. Betty C would have a fit. Truth be told, they're not that good though, so your post MAY have been enough to inspire me to make my own. 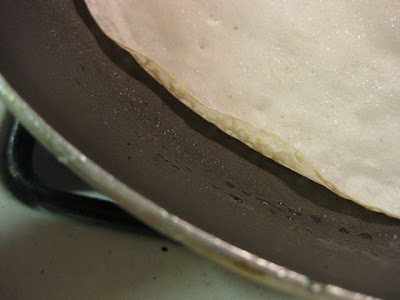 And while I agree that mayo is perhaps not the most inspirational of toppings, I HAVE made a couple savory crepe options with sour cream with much success. 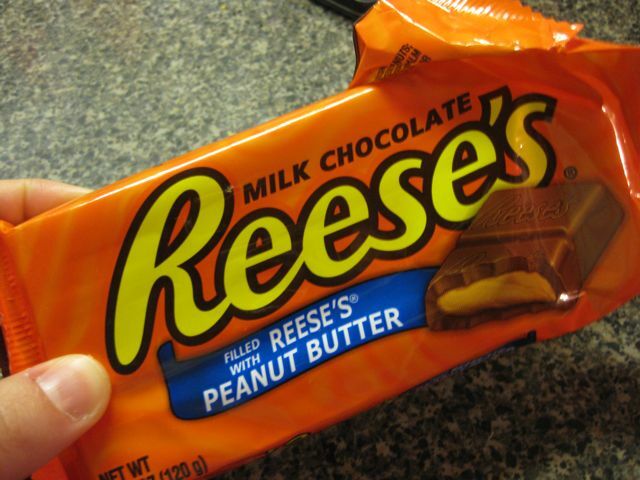 Probably not SundayTreats worthy though! Please sir, I want s'more. Have a comment or a question? Email us at KB.SundayTreats@gmail.com.